Railpictures.ca - Jason Noe Photo: On September 11, 2007 GEXR train 433 is seen setting-off empty frame cars at the then ThyssenKrupp Budd Canada facility. The consist includes GEXR GP38 3856, LLPX GP38AC 2210 and CN GP9RM 4141. The CN unit had arrived from London that night on an extra that had delivered several pieces of equipment for the new Waterloo Central Railway from St. Thomas. It would then hitch a ride on 433 back to London with a train load of newly manufactured vehicle frames from Kitchener. | Railpictures.ca – Canadian Railway Photography – photographie ferroviaire Canadienne. 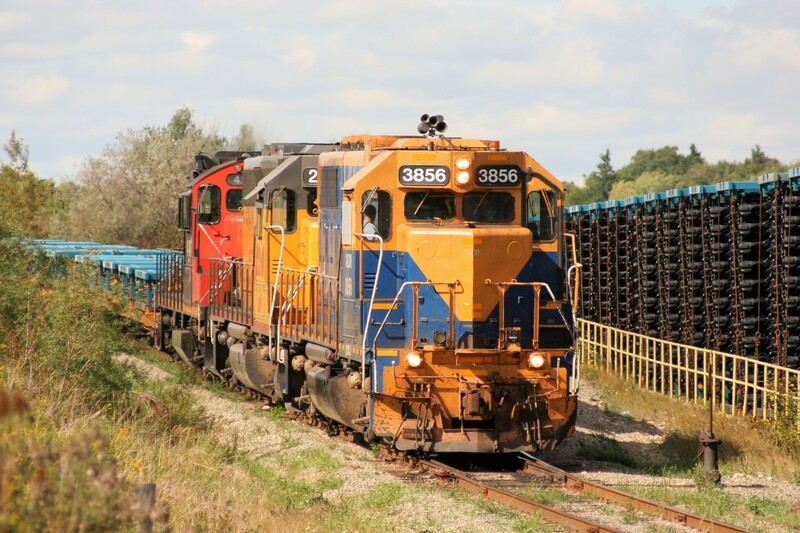 Caption: On September 11, 2007 GEXR train 433 is seen setting-off empty frame cars at the then ThyssenKrupp Budd Canada facility. The consist includes GEXR GP38 3856, LLPX GP38AC 2210 and CN GP9RM 4141. The CN unit had arrived from London that night on an extra that had delivered several pieces of equipment for the new Waterloo Central Railway from St. Thomas. It would then hitch a ride on 433 back to London with a train load of newly manufactured vehicle frames from Kitchener.